Good Governance Day has been declared a working day for government officials. Good Governance Day was established in 2014 to honor Atal Bihari Vajpayee. New Delhi: Good Governance Day is observed annually on December 25th, the birth anniversary of former Prime Minister Atal Bihari Vajpayee. Good Governance Day was established in 2014 to honor Mr Vajpayee by fostering awareness among the people of accountability in government. In keeping with this principle, the Good Governance Day has been declared to be a working day for the government. On December 23, 2014, Mr Vajpayee, and Pandit Madan Mohan Malaviya (posthumously) were announced as recipients of the Bharat Ratna, India's highest civilian award. 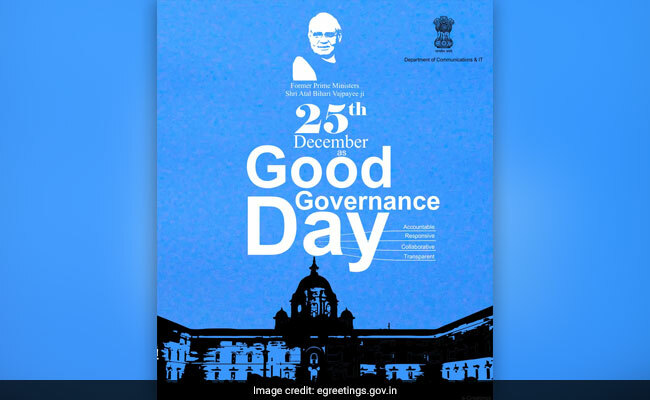 Good Governance Day is celebrated to enhance the welfare and betterment of the people. It is celebrated to standardise the government functioning and to make it a highly effective and accountable governance for the citizens of the country.